Coal Ash Hearings Continue. Tell Duke Energy to Stop Poisioning Us! Last week, neighbors of Duke Energy’s Belews Creek coal power plant showed up to demand removal of coal ash from Duke’s unlined, leaking pits near their community. An estimated 150 concerned citizens appeared at a North Carolina Department of Environmental Quality (DEQ) public meeting in Stokes County, following a news conference by proponents of excavating the ash and transferring it to a lined landfill away from surface waters. 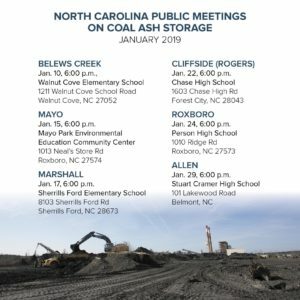 That meeting was the first of several scheduled by DEQ to take comments on multiple options for dealing with the enormous quantities of toxic coal ash stored near six Duke plants in North Carolina. The debate over how to address these coal ash pits continues to rage in the face of Duke’s proposal to leave much of the ash in those failing facilities. Environmental health advocates and other community representatives are calling for the concerned public to appear at a hearing or submit written comments for the public record of the case. The remaining five hearings are in Person County on January 15 and January 24, Catawba County on January 17, Rutherford County on January 22, and Gaston County on January 29. All hearings begin at 6 p.m. Written comments must be submitted by January 29. Debate centers on whether to remove the ash and relocate it to lined landfills, or leave the ash where it is and “cap in place” the existing unlined pits. Duke is now pitching what it calls “hybrid” options which include some of both. Environmental and community advocates want all the ash moved to lined landfills away from surface waters. 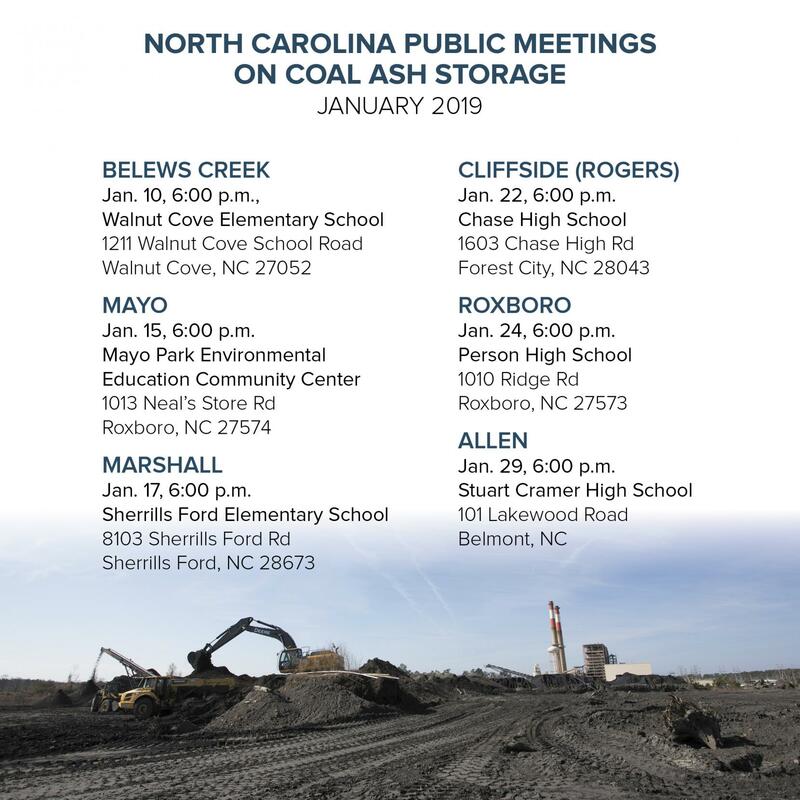 See more details regarding the coal ash handling alternatives, the hearings with location details, and a link for submitting comments online here. NCLCV encourages submission of comments in support of fully cleaning up the coal ash stored in unlined, leaking pits.